Why is Lunch My Toughest Meal of the Day? The nutrition nazi I saw to shape my new healthy eating plan post-angioplasty minced no words about it, there is no healthy way to eat out. Restaurant food has too much of everything that’s bad for me, salt, sugar and fat. Yet I eat lunch out every day of the workweek and some weekend days as well. I need that time away from my office to break the daily routine and clear my head. 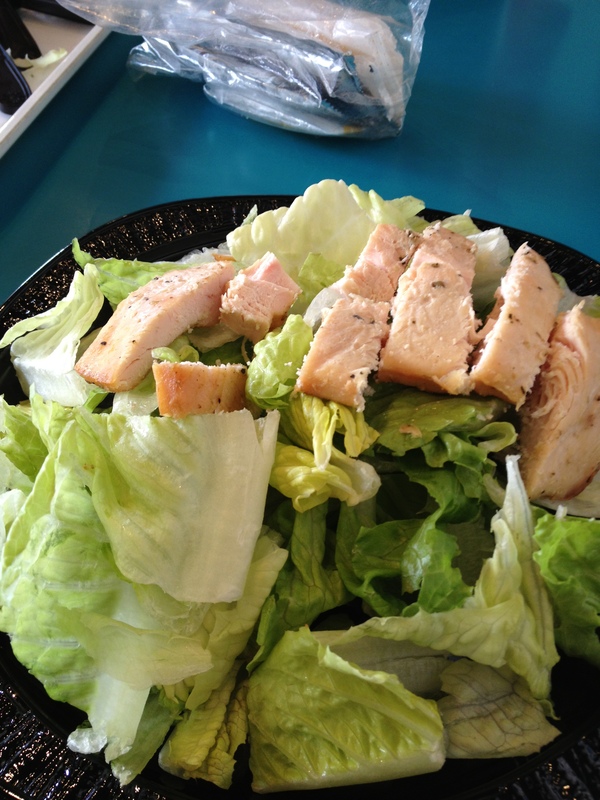 So my lunches have become pretty much nothing but salads. I normally eat at the food court in Chicago’s mammoth Merchandise Mart building, which is only a block from my office. It has an Arby’s, a McDonald’s, a Japanese fast sushi place, a Mexican place, a pizza place, a Mideastern fast food place and a place with a build-your-own salad bar. The build your own salad place has become pretty much my daily stop. My usual salad has field greens, cucumbers, tomatoes, artichoke hearts, red quinoa, dried cranberries, a chicken breast, celery, garbanzo beans, and beets. Several of those items may actually be on my forbidden list, dried cranberries have sugar, for example, but I’m hoping the small number each day are ok so I have some flavor. I bypass all the dressings there and bring my own individual packets of olive oil and vinegar that I bought in bulk on Amazon. Using Lose It!, a calorie counting and nutrition app for my iPhone, I put the calorie count for that at 521 calories. I bring along a 32-ounce bottle of water from my office because I detest paying for small bottles of water. I don’t know how much salt is on the chicken, I’m hopeful it’s no more than the 960 mgs that are in a McDonald’s Southwest Salad, which is my fallback daily salad. There too, I use my own oil and vinegar to avoid the high salt content in Newman’s Balsamic Vinaigrette, my previous dressing of choice. To make the McDonald’s salad more of a meal, I’ve been buying two side salads and mixing them in. Total calorie count for all that is 518, including my half-ounce of olive oil. I was hopeful that plain chicken kabobs and sides of hummus and pita bread at the Mideast place would fit my diet as well, but that hope was dashed when I requested nutrition information from the restaurant. The kabobs are only 194 calories each (I order two), but each has 322 mgs of salt, so two are 644 mgs. That in itself isn’t bad but the pita ruins it for me because each round of pita bread has 300 mgs of salt, so eating two of those with my hummus sides brings in another 600 mgs of salt, putting the entire meal at 1,244 mgs of salt or about my daily limit. Each three ounces of hummus has 135 mgs of salt, so two are 270, meaning the meal I was picking is at 1,514 mgs of salt. So these day, I eat one order of hummus and half a slice of pita to cut the salt by 585 mgs. When I asked the person from the restaurant who sent me this information if the chicken could be made unsalted, he said it was impossible. It arrives marinated for cooking. He tried to commiserate with me by saying he has to watch his salt intake as well because of high blood pressure! Wonder where he eats lunch?